A Sino-Israel contest has been held in Putuo District to deepen cooperation between the two nations and attract Israeli startup teams to the city. 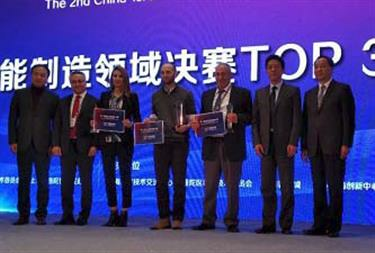 The top three winners with their awards at the 2nd China-Israel Innovation and Entrepreneurship Contest. The China-Israel Innovation and Entrepreneurship Contest, the second of its kind organized by the Putuo government, the Sino-Israel Technology Innovations Center and other parties, covers life sciences, smart manufacturing and information and communication technology. Over 400 officials, consulates, investors and entrepreneurs took part in the event at the Hyatt Regency Shanghai Global Harbor hotel in Putuo on December 15. Three Israeli teams won awards at the contest, part of a joint effort between China and Israel to find innovative Israeli technologies most suited for use in China. The Putuo District government has been accelerating construction of the Sino-Israel (Shanghai) Innovation Park and optimizing the business environment for Israeli innovative and startup firms, Zhou Minhao, director of Putuo said in his opening remarks at the event. “Putuo takes the contest as an opportunity to attract and support excellent projects or teams to settle down in the innovation park,” said Zhou. As the western gateway of Shanghai and to the Yangtze Delta region, Putuo has the advantage to attract innovative resources from Israel and serve the Yangtze Delta region, he added. Putuo has launched a Sino-Israel Innovation Fund with an initial billion yuan (US$145 million) to mainly support new startups. The first batch of companies and agencies to base in the innovative park can also enjoy exemptions on district-level taxes for three years, along with lease-free policies and decoration subsidies, the Putuo government has said. High-end talent apartments covering at least 10,000 square meters will be built along with 35,000 square meters of cultural, education and medical facilities. A website and publicity platform will also be established to showcase the winning projects selected from the contest and seek cooperation. This year, about 300 Israeli enterprises registered for the competition and 28 made it into the finals, included nine participating in the final of smart manufacturing in Putuo. The top winner in smart manufacturing was the Newsight Imaging team, which has developed advanced semiconductor sensor chips for machine vision to enable 3D vision, for use everywhere from robotics to smartphones, with higher sensitivity and performance while lowering power consumption. The runner-up was MIR, a company that builds advanced automation systems, and third place went to Out of Screens, a company that has developed a 3D printing machine with a universal connector for multiple printing heads and additional crafting tools. During the contest, the China-Israel Shanghai Innovation Center joined with several investment organizations to launch a fund to exclusively invest in outstanding projects from the competition, with an initial investment scale of 55 million yuan.